This pretty green Florentine Number 2 Poppy Number 2 depression glass 4 inch 9 Ounce Flat Water Tumbler was made by Hazel Atlas from 1932 to 1935. This Tumbler is in very good condition with no chips or cracks. Be sure to search our other Florentine available. We guarantee items to be as described. Feel free to email any questions. THANK YOU. 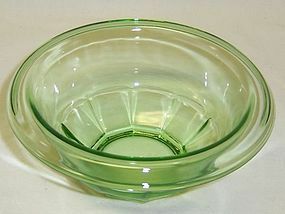 This really pretty green Florentine Number 2 Poppy Number 2 depression glass Undivided Oval Relish Dish was made by Hazel Atlas from 1932 to 1935. This Relish Dish measures 9 3/4 inches long X 6 1/8 inch across. It is in very good condition with no chips, cracks or scratches. Be sure to search our other Florentine available. We guarantee all items to be as described. Feel free to email any questions. THANK YOU. This really pretty green Florentine Number 2 Poppy Number 2 depression glass 3 1/4 Inch diameter Coaster was made by Hazel Atlas from 1932 to 1935. This Coaster is in very good condition with no chips, cracks or scratches. Be sure to search our other Florentine available. We guarantee all items to be as described. Feel free to email any questions. THANK YOU. This really nice Childrens Farm Animal Mug was made by Hazel Atlas. This Mug is milk white with red designs featuring a Rooster, Pig, Sheep and Duck. It measures 3 3/4 inches high X 2 5/8 inches diameter at the top and is in very good condition with no chips or cracks. The animal designs are all very good. It is not signed. Be sure to search our other childrens items available. We guarantee items to be as described. THANK YOU. This really nice pink Criss Cross Crisscross 7 5/8 inch diameter Mixing Bowl was made by Hazel Atlas. This Mixing Bowl measures 3 1/4 inches high. It is in very good condition with no chips, cracks or scratches. The inside of the bowl is shiny. We guarantee items to be as described. THANK YOU. This really nice pink Criss Cross Crisscross 9 1/4 inch diameter Mixing or Utility Bowl was made by Hazel Atlas. This Mixing Bowl measures 4 1/2 inches high. It is in very good condition with no chips, cracks or scratches. The inside of the bowl is shiny. We guarantee items to be as described. THANK YOU. This really pretty pink Criss Cross Crisscross Orange Reamer or Juicer was made by Hazel Atlas. This Reamer is in really good condition with no chips, cracks or scratches. This can be a hard reamer to find. Be sure to search our other Criss Cross available. We guarantee all items to be as described. Feel free to email any questions. THANK YOU. This pretty pink Florentine Number 1 Poppy Number 1 depression glass Creamer and Sugar Bowl with Ruffled Edges were made by Hazel Atlas from 1932 to 1935. 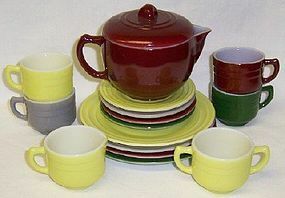 Both the Creamer and Sugar Bowl are in very good condition with no chips or cracks. Be sure to search our other Florentine available. We guarantee all items to be as described. Feel free to email any questions. THANK YOU. 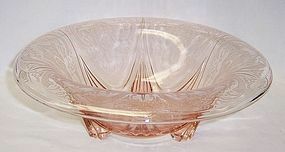 This really pretty pink Florentine Number 2 Poppy Number 2 depression glass 10 Inch 3 Part Relish Dish was made by Hazel Atlas from 1932 to 1935. This Relish Dish is in very good condition with no chips or cracks. Be sure to search our other Florentine available. We guarantee all items to be as described. Feel free to email any questions. THANK YOU. This is a really pretty pink rayed Florentine Number 1, aka Poppy Number 1, 4 inch 9 ounce Flat Water Tumbler made by Hazel Atlas from 1934 to 1936. This Tumbler can be hard to find. The glass is rayed vertically on the tumbler. It measures 3 Inches in diameter across the top and is in very good condition with no chips, cracks or scratches. Be sure to search our other Florentine available. We guarantee items to be as described. THANK YOU. 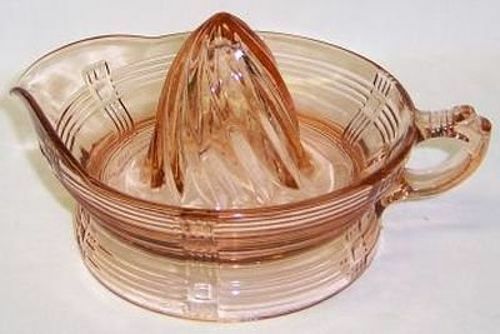 This really pretty pink Florentine Number 2 Poppy Number 2 depression glass Ruffled Compote was made by Hazel Atlas from 1932 to 1935. This Compote measures 4 3/4 inches in diameter at the top X 3 inches high. It is in very good condition with no chips or cracks. Be sure to search our other Florentine available. We guarantee all items to be as described. Feel free to email with any questions. THANK YOU. 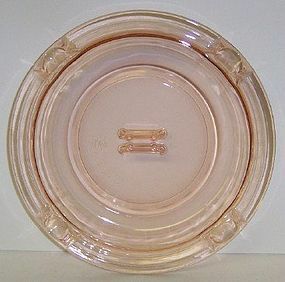 This really pretty pink Moderntone depression glass 7 3/4 Inch Ash Tray with Center Match Pack Holder was made by Hazel Atlas from 1934 to 1942. This can be a hard item to find. It is in excellent condition with no chips, cracks or scratches. Be sure to search our other Moderntone available. We guarantee all items to be as described. THANK YOU. 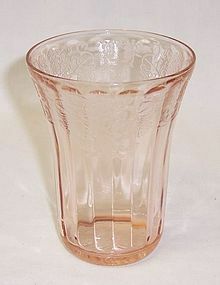 This is a really great, hard to find, Pink Pig on crystal Old Fashioned Whiskey tumbler, made by Hazel Atlas Glass. This Tumbler measures 3 1/4 inches high X 2 3/4 inches in diameter at the top. This tumbler is in excellent condition with no chips, cracks or scratches. The painted Pink Pig decoration is all very good. Be sure to search our other Pink Pig beverage items available. We guarantee all items to be as described. Feel free to email any questions. THANK YOU. 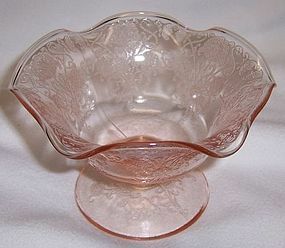 This is a pretty pink Royal Lace depression glass 10 1/4 inch diameter X 3 1/2 inches high 3 Leg Rolled Edge Bowl made by Hazel Atlas from 1934 to 1941. This Bowl is in very good condition with no chips, cracks or scratches. Be sure to search our other Royal Lace available. We guarantee items to be as described. THANK YOU.